Card three from Club last weekend! Using a stamp I should have had long before now but didn't-the Triple Treat Flower. Sadly, it is retiring. 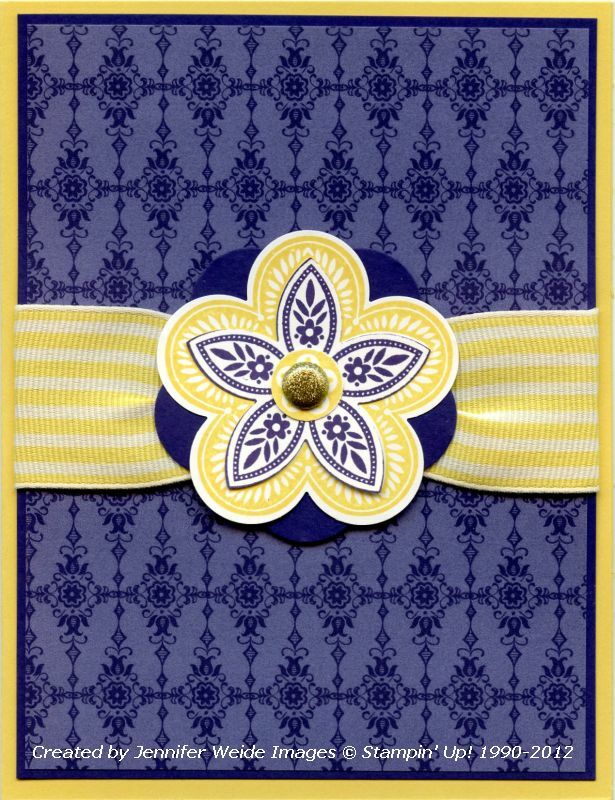 The card base is Daffodil Delight with a Concord Crush accent layer behind a background print of Concord Crush DSP. Miss Concord Crush already!!! We stamped the flower 3 times: twice in Daffodil, once in Concord. Both on Whisper White. The first Daffodil, we punched with the Fancy Flower punch. The second Daffodil, we punched just the 1/2" circle for the center. The Concord one was punched with the 5-Petal Flower punch. We layered all the pieces together, adding a solid Concord Crush Fancy Flower punch at the back. Through the center we added a Saffron Glitter brad. Not the exact color of Daffodil, but it blends very well. A Concord one would have worked as well, but mine are all gone. To gather the Wide Grosgrain ribbon in the center, we tied a piece of Bakers Twine in the center. Knot it, and pull it completely tight. 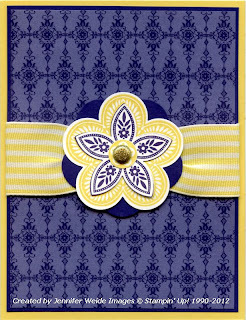 Then attach the ribbon to the center of the back of the Concord layer and add the flower over the ribbon with dimensionals. I opted not to add a saying. There just didn't seem to be the right place to do one.